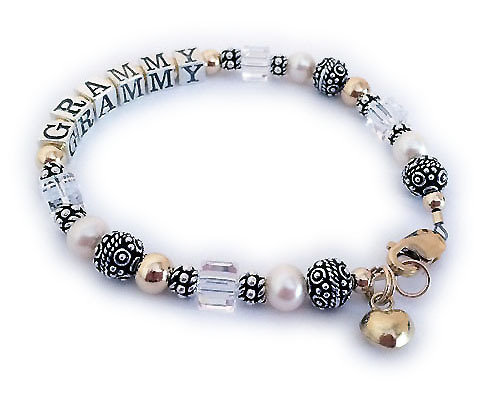 Shown with an upgraded lobster claw clasp - "Heart Lobster"
This Gold Grammy bracelet is shown with 4-string and 4 grandkids' names on a 4-string slide clasp. I recommend a slide clasp with 3 or more strings but you may pick any clasp you like! Serena is shown with December or Blue Topaz Swarovski Crystals. Jacob is shown with February or Amethyst Swarovski Crystals. Moriah is shown with December or Blue Topaz Swarovski Crystals and Shiloh is shown with July or Ruby Swarovski Crystals. 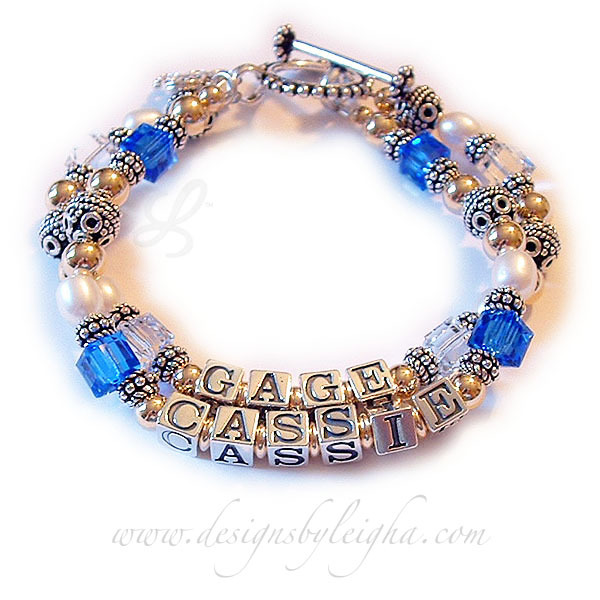 DBL-G8 - 2 string bracelet with 2 grandkids names. Both the Samantha and Nicholas string have April or Clear Swarovski crystals. This bracelet is shown with a Beaded Toggle Clasp. 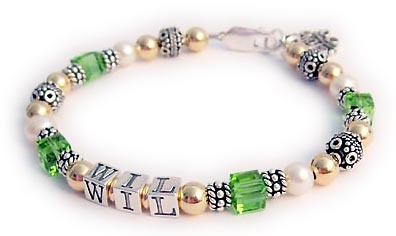 This 1-string Grandma Gold Name Bracelet is shown with WIL and August or Peridot Swarovski Crystals. It is hard to see but they added a FILIGREE LOVE charm to their order and chose one of my beautiful free lobster claw clasps. 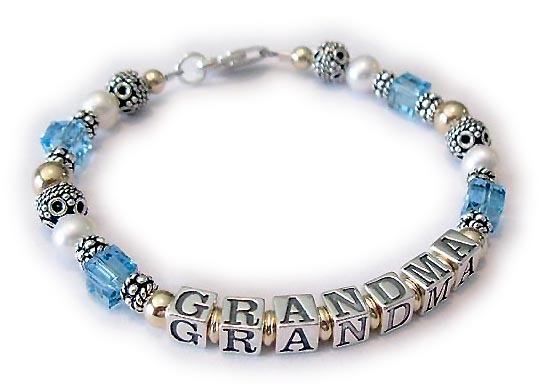 This 1-string Grandma Gold Name Bracelet is shown with GRANDMA and March or Aquamarine Swarovski Crystals. They chose one of my beautiful free lobster claw clasps. 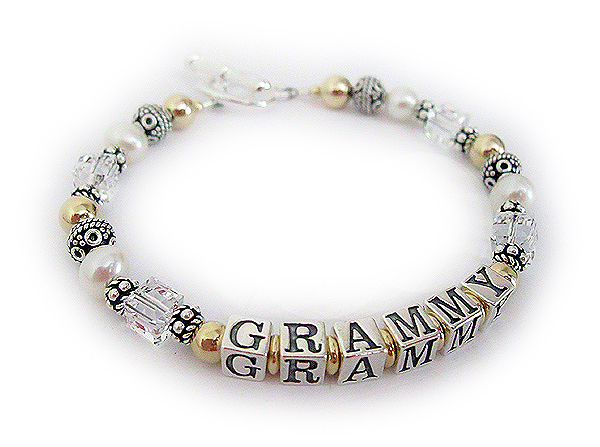 This 1-string Grandma Gold Name Bracelet is shown with GRAMMY and April or Clear Swarovski Crystals. They upgraded to one of my 14k gold-plated lobster claw clasps and add a 14k gold-plated Puffed Heart charm. The GAGE string is shown with April or Clear Swarovski Crystals. The CASSIE string is shown with September or Sapphire Swarovski crystals. This bracelet is shown with a Beaded Toggle Clasp. This bracelet is shown with a Heart Lobster Clasp. 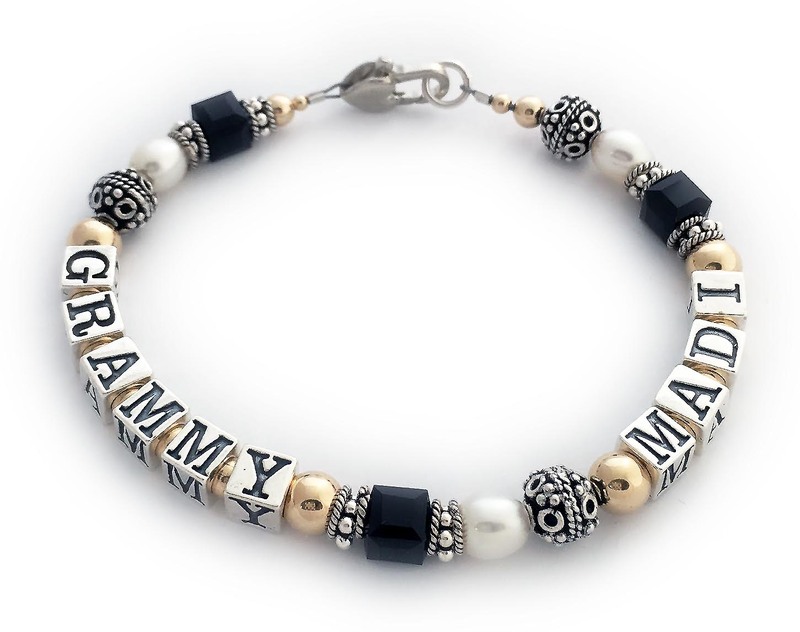 This Gold Grammy bracelet is shown with 3-string and 3 grandkids' names on a 3-string slide clasp. I recommend a slide clasp with 3 or more strings but you may pick any clasp you like! Serena is shown with December or Blue Topaz Swarovski Crystals. Jacob is shown with February or Amethyst Swarovski Crystals. Moriah is shown with December or Blue Topaz Swarovski Crystals. 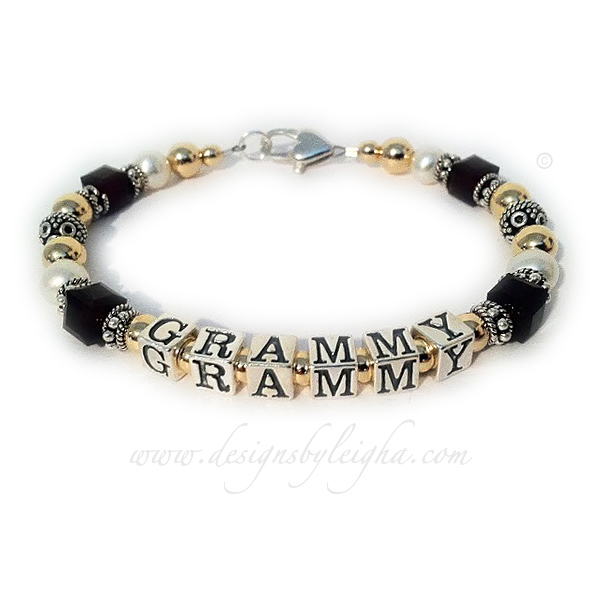 This 1-string Grandma Gold Name Bracelet is shown with GRAMMY and April or Clear Swarovski Crystals. It is hard to see but they upgraded to a Heavy Heart Toggle clasp. A free lobster or toggle clasp is included in the price. 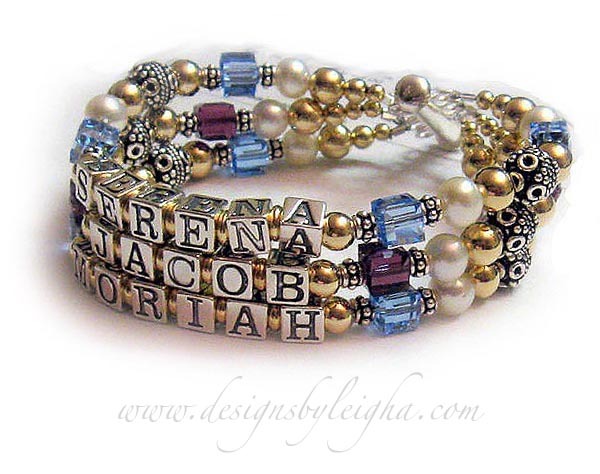 DBL-G8- 3 string bracelet with 3 grandkids names. 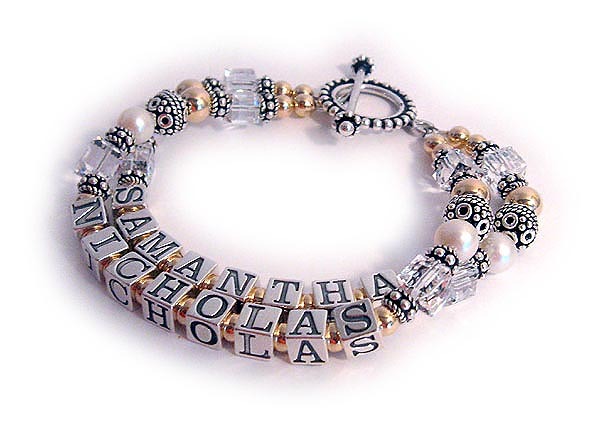 This 3-string Grandma Gold Name Bracelet is shown with grandkid names. The GABRIELLE, TIMOTHY and HALLE strings all have April or Clear birthstones. You may choose your favorite color (I have 18 colors to choose from) or pick their birthstones during the ordering process.